On Feb. 5, 2013, Navy PO1 Christopher Andrieu was severely injured by an improvised explosive device (IED) in Helmand, Afghanistan. Petty Officer Andrieu was an Explosive Ordnance Disposal (EOD) Technician with Seal Team Five, and on his second deployment. Chris and his team were searching a bridge for IEDs, and after three hours they had found and disposed of four of them. The team was about to rest when EOD1 Andrieu stepped off of the cement surface and directly onto a fifth IED. Chris, conscious the whole time, pinched his own artery to stop the bleeding. 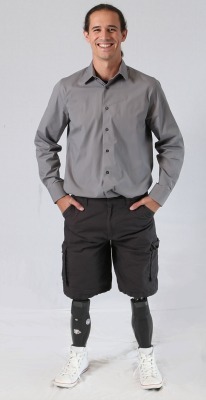 Chris’ legs were surgically amputated above the knee in Afghanistan as a result of the blast. After arriving in the United States, he was treated at Walter Reed, and then Balboa Naval Hospital, where he recovered around friends and family. After enduring numerous surgeries, he was in his first set of prosthetics within months, and running a Tough Mudder before the end of the year. Now medically retired, Chris continues to be active, but needs to rest his legs while at home. He was unable to do so in his previous home because it was not wheelchair accessible. His wife Autumn would often worry about Chris falling, especially while holding their young daughter Aria. Chris and Autumn are relieved to be now have their specially adapted custom HFOT home, where Chris can live safely and they can continue to expand their family. A few months after receiving their home, Chris and Autumn welcomed their second child, Natalie, into their lives in December 2018. Chris is happy to now have space to work on his 1968 Mustang. He was inspired to work on cars by his father, a Coast Guard Veteran of 30 years. When his father died, Chris took on the role to keep the tradition alive, and now hopes to go to school to be a mechanic. Chris and Autumn chose to build their home in the San Diego area to be near family. Chris and Autumn say Homes For Our Troops is different than most organizations. “HFOT feels like a family supporting each other. Most organizations focus on getting Veterans out of the house, but most of our lives are spent at home,” Chris says.